When Marquette‘s leading scorer, Markus Howard left just three minutes into the game with back spasms, the Golden Eagles needed somebody to step up. The team’s second leading scorer, Sam Hauser, did just that. Hauser poured in a career high 31 points and Theo John tied a career high with 14 points to lead No. 15 Marquette (15-3, 4-1 Big East) to a 74-71 win over the Georgetown Hoyas in Washington D.C. Hauser scored 22 of his 31 points in the second half, including a basket that broke a 70-all tie with less than a minute remaining. Georgetown (12-6, 2-3) was led by Mac McClung with 24 points while Jessie Govan added 14 points and nine rebounds. The Golden Eagles won their fourth straight for the first time since 2013. They return home Sunday to face Providence, which has started just 1-3 in conference play. The Marquette Golden Eagles jumped out to a quick start and led second ranked Kansas 47-38 at halftime. But the Jayhawks opened the second half with 22 unanswered points to pull out a 77-68 victory in the NIT Season Tip-Off at the Barclays Center in Brooklyn. The Golden Eagles missed their first 10 shots and added five turnovers before junior forward Sam Hauser hit a three-pointer with 10:45 left to play. Kansas turned a 9-point deficit into a 13-point lead and improved to 4-0 with the win. Marquette struggled to score in the second half and didn’t attack the basket at all. The Golden Eagles didn’t shoot free throws until there was 4:21 left in the game. They finished 4 for 5 from the line. Sam Hauser led Marquette in scoring with 20 points. Markus Howard added 18 but hit just 6 of 23 from the field. Marquette returns to action Friday when they take on Louisville in the NIT Season Tip-Off consolation game. Senior Andrew Rowsey – Photo courtesy of Marquette Athletics. Marquette’s post-season run ended in the N.I.T. quarterfinals, falling 85-80 to the Penn State Nittany Lions at the Al McGuire Center on Tuesday night. Senior Andrew Rowsey poured in 29 points in his final game with the Golden Eagles. He ends the year with 716 points, surpassing Dwyane Wade’s 710 points recorded during the 2002-03 Final Four season. 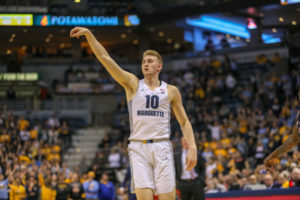 He also tied a season-best with six 3-pointers to move him past Steve Novak (121 in 2005-06) into first in Marquette single season history with 125 triples. Markus Howard added 21 points for the Golden Eagles (21-14) while Sam Hauser finished with 13 points. The Nittany Lions (24-13) will face either Mississippi State or Louisville at Madison Square Garden in New York on March 27. They advanced to the NIT semifinals for the first time since winning the 2009 tournament. Penn State is now 6-0 in N.I.T. quarterfinal games. 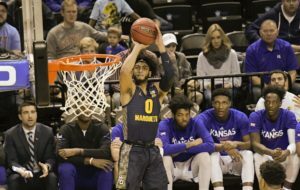 Despite 17 turnovers and a struggling offense, the Marquette Golden Eagles survived and knocked off Harvard 67-60 in the opening round of the National Invitation Tournament. With the two teams struggled while playing under new NIT rules, including a longer three-point line. They collectively combined to shoot 18 of 53 from the field while committing 18 turnovers. Marquette led 27-21 at the half, then pushed their lead to 19 in the fourth quarter. Harvard was able to then cut the lead to five at 65-60, large in part to Marquette turnovers. Markus Howard had 22 points to lead the Golden Eagles (20-13), who advance to the second round against Oregon at the Al McGuire Center on Sunday at 3:30 p.m.
Andrew Rowsey added 15 and Sophomore forward Sam Hauser was held to four points on 2-of-5 shooting. He was in foul trouble throughout and played just 15 minutes. The Golden Eagles hit 7 of 16 three pointers from the longer distance of 22 feet, 1 3/4 inches. Sam Hauser – Photo Courtesy of Marquette athletics. The Marquette Golden Eagles lived to play another day at the Big East Tournament, holding off the DePaul Blue Demons 72-69 on Wednesday night at Madison Square Garden in New York. 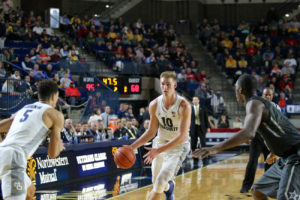 Andrew Rowsey poured in a game high 25 points, while Sam Hauser added 16 and Sacar Anim 14 for the Golden Eagles, who advanced to Thursday nights matchup against second-seeded Villanova. The Wildcats are the defending Big East Tournament champions. Hauser scored 14 of his 16 points in the second half. 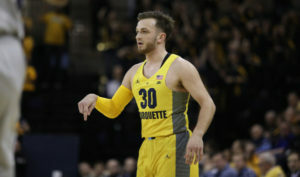 he hit a pair of free throws with 32 seconds left to put Marquette (19-12, 9-9 Big East) up four before DePaul’s Max Strus hit a three pointer to pull the Blue Demons within one, 70-69. After Rowsey turned the ball over at midcourt, Strus missed a three pointer that would have given the Blue Demons the lead. 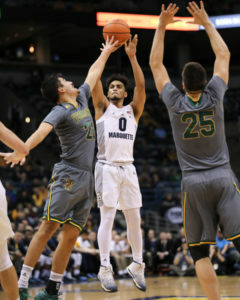 Rowsey grabbed the rebound and sank two more free throws to give Marquette the three-point win. Marquette has now advanced to the Big East quarterfinals in every season since it became a league member in 2005-06. Their matchup with Villanova tips off at 6 p.m. tonight on FS1. 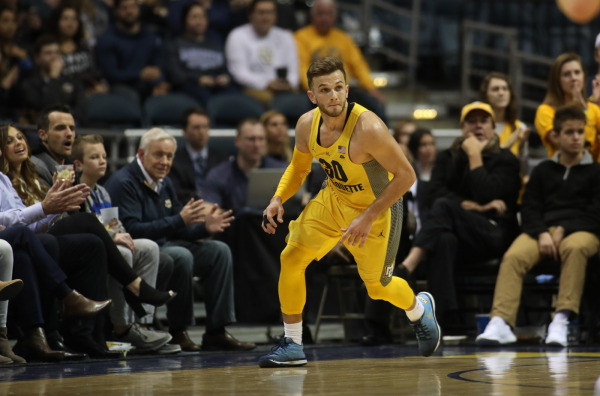 Senior guard Andrew Rowsey and sophomore forward Sam Hauser poured in 28 points each to lead the Marquette Golden Eagles to a 90-86 win in overtime at Georgetown. The Golden Eagles (17-12, 8-9 Big East) hit 18 of 31 from three-point distance, helping offset 14 turnovers and Georgetown’s 26 points in the paint. Marquette closes out its regular season on Saturday at home against Creighton. That will be followed by the start of the Big East Tournament next week at Madison Square Garden in New York. The Marquette Golden Eagles continued its late-season push for a spot in the NCAA Tournament Field by knocking off St. John’s 85-73 on Wednesday night at the BMO Harris Bradley Center. 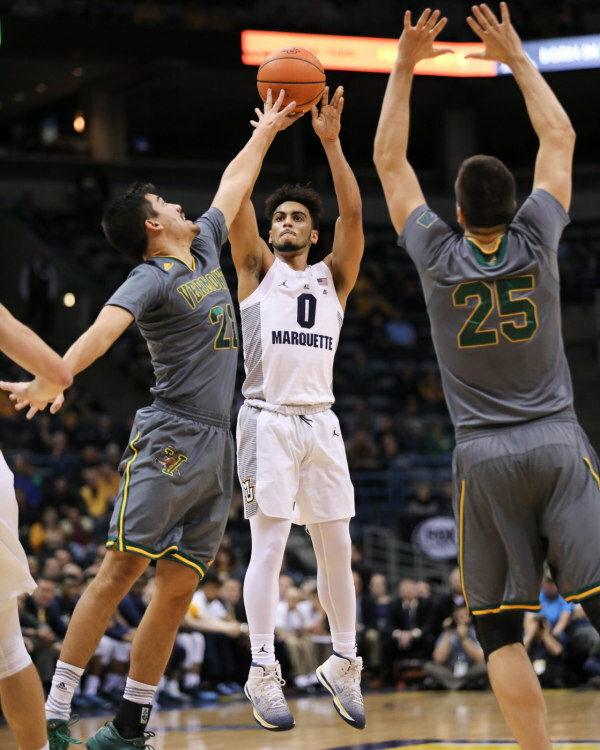 Sam Hauser led five Marquette players in double figures with 24 points. The Golden Eagles (16-11, 7-8 Big East) led by just four points at halftime but separated themselves in the second half. They handed St. John’s (14-14, 3-12) with its first loss in the last five games. Marquette hit its first four 3-pointers of the second half and helped the Golden Eagles led by as many as 20 points in the stanza.